Images and photographs sometimes fall short of conveying just how beautiful a location may be. Making sucessful photographs is about knowing not only what to include within the frame, but what not to include. 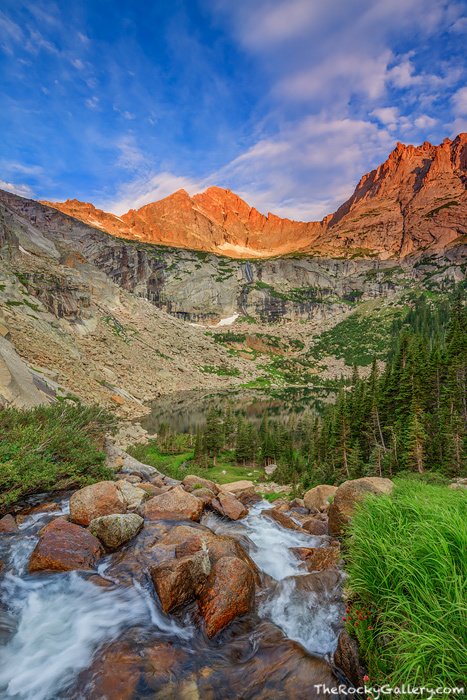 Scenes such as this just above the inlet to Black Lake in Rocky Mountain National Park present the photographer with just such a dilema. The area around Black Lake is just so spectacular, it's easy to be overwhelmed by it's scenery and grandeur. Waterfalls cascading from granite walls at the base of the peaks, beautiful clouds skirt over the mountains, and soft lighting bathes McHenry's Peak and Arrowhead peak with warm morning light. Climbing above a placid Black Lake and photographing this location this morning was without a doubt one of my most memorable mornings in the Glacier Gorge area as well as Rocky Mountain National Park. Photo © copyright by Thomas Mangan.